In the construction industry, mistakes happen. When they do happen, they can often be incredibly expensive, assuming somebody catches the mistake before the structure is finished. Remember the Leaning Tower of Pisa? 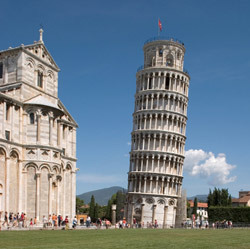 Remember the Leaning Tower of Pisa? Oops! Taking the time to do a job the right way wins every time. Our Stauffer & Sons field employees’ motto for years has been: “Safety, Quality, Speed“—in that order. Aside from safety, which is has top priority, we focus hard on quality over speed. Why? The following equation explains. Let’s use a common scenario in construction: building a wall. When you’re having a home built, make sure your builder is putting quality over speed. Some builders have made a business model out of cranking homes out as fast as possible, to move on the next quickly. Stauffer & Sons works fast, but never places speed above doing the job right from the ground up. It is much more cost effective to do a job correctly the first time, because as the equation shows, it actually wastes five whole hours by spending one hour doing a job the wrong way! Mike Rice is the Project Manager for Stauffer & Sons Construction, a custom home building company in Colorado Springs, Colorado. Stauffer & Sons has built dozens of custom homes across the Pikes Peak region, including homes that use solar and geothermal energy for off-grid living. Visit www.staufferandsons.com for more information.